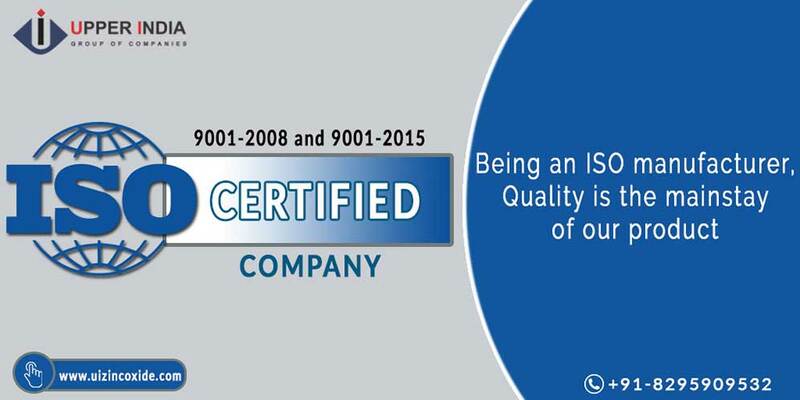 Upper India is an ISO certified company that has marked its presence in India and global market as a trusted brand in the manufacturing of Zinc Oxide. We have an established premium quality brand logo ‘W’ which is the symbol of our best quality Zinc Oxide products available in various grades like Zinc Oxide grade UI-I, Zinc Oxide grade UI-II, Zinc Oxide grade UI-III, and Zinc Oxide grade UI-IV. We are also into export and distribution of Zinc Oxide in various grades for catering the distinct industry needs like rubber, paint, footwear, food specialty, cosmetics, skincare, glass & ceramics, agriculture, and other chemicals. Upper India manufactures Zinc Oxide by the French process. In this way of production, the starting material is Zinc, which is made volatile by the medium of heat. This volatile vapour is drawn into an oxidation chamber where it reacts with oxygen. Controlled conditions at the oxidation stage produce the particle size conforming to the individual grades manufactured. When cooled, the zinc oxide is collected, sampled & analyzed to ensure conformity to grade specifications. The purity, consistency & uniformity of particle size are assured through the application of Statistical Process Control & Quality Assurance. Zinc oxide has several grades and applications which are being used in many areas of our lifestyle. Be it health supplements, rubber tire, cosmetic products or related to Agriculture field. We aim at maintaining a consistent quality of our Zinc Oxide grades that tends to exceed the expectations of our esteemed customers. We strive to meet the emerging market demands accurately and deliver our product at cos the -effective price. We are running two manufacturing units in India successfully. For any business inquiry or more information, please visit this link you can send your message via email or call us on the phone numbers provided on the website. We would be happy to assist you. © 2019 Upper India. All Rights Reserved.